Venerable Sergius of Radonezh (Russian: Се́ргий Ра́донежский, Sergii Radonezhsky; 14 May 1314 – 25 September 1392), also transliterated as Sergey Radonezhsky or Serge of Radonezh, was a spiritual leader and monastic reformer of medieval Russia. Together with Venerable Seraphim of Sarov, he is one of the Russian Orthodox Church's most highly venerated saints. The date of his birth is unclear: it could be 1314, 1319, or 1322. His medieval biography states that he was born to Kiril and Maria, a boyar family, near Rostov the Great, where Varnitsy Monastery now stands. The narrative of Epiphanius does not specify the exact birthplace of the monk, stating only that before the migration from Rostov principality the monk's family lived "in a village in the area, which is within the Rostov principality, not very close to the city of Rostov". It is considered that it is the village Varnitsa (Russian: Варница) near Rostov. The future saint received the baptismal name of Bartholomew (Варфоломе́й Varfolomei in Russian) in honor of the Apostle Bartholomew. Although an intelligent boy, Bartholomew had great difficulty learning to read. His biography states that a starets (spiritual elder) met him one day and gave him a piece of prosphora (holy bread) to eat, and from that day forward he was able to read. Orthodox Christians interpret the incident as being an angelic visitation. When the Principality of Rostov fell into the hands of Prince Ivan Danilovich of the Grand Duchy of Moscow, his parents Kirill and Maria became impoverished and moved to Radonezh together with their three sons, Stefan, Bartholomew and Peter. Upon his parents' death, Bartholomew went to Khotkovo near Moscow, where his older brother Stefan was a monk. He persuaded Stefan to find a more secluded place to live the ascetic life. In the deep forest at Makovets Hill they decided to build a small cell and a church dedicated in honor of the Trinity. Thus started the history of the great Trinity-St. Sergius Lavra. In time, Stefan moved to a monastery in Moscow. Varfolomei took monastic vows, taking the name Sergius, and spent more than a year in the forest alone as a hermit. Soon, however, other monks started coming to him and building their own cells. After some time, they persuaded him to become their hegumen, or father superior, and he was ordained to the priesthood. Following his example, all the monks had to live by their own labor. Over time, more and more monks and donations came to this place. Nearby, there appeared a posad, which grew into the town of Sergiev Posad, and other villages. When the news of Sergius's accomplishments reached Patriarch Philotheus of Constantinople, he sent to him a monastic charter. During the reign of St. Dmitri Donskoi, his disciples started to spread his teaching across central and northern Russia. They settled intentionally in the most impracticable places and founded numerous monasteries, of which Borisoglebsky, Ferapontov, Kirillo-Belozersky and Vysotsky monasteries could be mentioned. 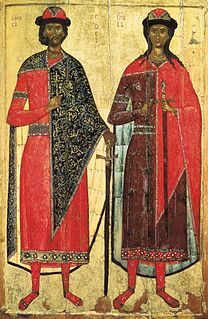 St. Sergius was also connected with the foundation of two monastic communities in Moscow, Andronikov and Simonov monasteries. All in all, the disciples of Sergius founded about 40 monasteries, thus greatly extending the geographical extent of his influence and authority. However, when Metropolitan Alexius asked him to become his successor, Sergius declined, preferring to remain a simple monk. As an ascetic, Sergius did not take part in the political life of the country. However, he blessed Dmitry Donskoy when he went to fight the Tatars in the signal Battle of Kulikovo field, but only after he was certain Dmitry had pursued all peaceful means of resolving the conflict. Some historians interpreted his political stance as aspiring to make peace and unite Russian lands under the leadership of Moscow. Sergius died on September 25, 1392, and was glorified (canonized) in 1452. His incorrupt relics were found in 1422 and placed in the new Trinity Cathedral of the lavra which he founded. The church commemorates him on September 25, the day of his death, and on July 5, the day his relics were uncovered. (See September 25 (Eastern Orthodox liturgics)). Among the many affectionate titles given him, he has been referred to as the "Abbot of Russia" and "valiant voivod" of the Russian land. The Catholic Church officially recognizes Sergius as a saint, and he is honored in the Calendar of Saints of several churches of the Anglican Communion. The ecumenical Fellowship of Saint Alban and Saint Sergius is named in part for him. In December 1937, Pavel Florensky (1882–1937), a Russian theologian, priest, mathematician, inventor, philosopher and engineer died in the Soviet Gulag and it is thought he was condemned by an extrajudicial NKVD troika under NKVD Order No. 00447 to be executed during the 1930s Bolshevik purges after refusing to disclose the hiding place of Sergius' head which the Bolsheviks wanted destroyed. It is rumored that Florensky and other theologians were involved in a plot to save and hide the relics of St. Sergius. The relics were returned by Pavel Golubtsov, later "Archbishop Sergius," to the Troitse-Sergiyeva Lavra (Trinity Cathedral) of the lavra in 1946 when it was reopened. May 2014 marked 700 years since the birth of St. Sergius of Radonezh (1314-1392), a patron saint of Russia. Much information about the saint and his acts is taken from the writing of his life composed in the 15th century, which has come down to us in many later editions in the 15th to 20th century Russian manuscripts. The memory of Sergius of Radonezh has lived on thanks to the unique manuscript entitled "The Life of St. Sergius of Radonezh" written by famous hagiographer Pachomius the Serb, also known as Pachomius Logothetes. The original manuscript is housed in the National Library of Russia. Icon of Sergius of Radonezh painted for Abramtsevo church by Viktor Vasnetsov, 1882. Sergius of Radonezh blessing Dmitri Donskoi before the Battle of Kulikovo in a painting by Ernst Lissner. Varnitsy Monastery of St. Sergius commemorates the saint's birthplace. The reliquary containing the relics of Saint Sergius at the Catholicon of Holy Trinity-St. Sergius, Lavra, Sergiev Posad. ^ Nikon Christmas (archbishop) (2003). Житие и подвиги преподобного Сергия Радонежского [The Life and Deeds of St. Sergius of Radonezh] (in Russian). Moscow: Trifonov Pechenga Monastery. pp. 32–33. ^ Житие преподобного Сергия Радонежского [Life of St. Sergius of Radonezh] (in Russian). ^ Maccioni, Antonio. "Pavel Aleksandrovič Florenskij. Note in margine all'ultima ricezione italiana" in eSamizdat (2007) V:(1-2):471-478. In Italian. Wikimedia Commons has media related to Sergius of Radonezh. Epiphanius the Wise was a monk from Rostov, hagiographer and disciple of Saint Sergius of Radonezh. Historian Serge A. Zenkovsky wrote that Epiphanius, along with Stephen of Perm, along with St. Sergius of Radonezh, and the painter Andrei Rublev signified "the Russian spiritual and cultural revival of the late fourteenth and early fifteenth century." Saint Job of Pochayev, to the world Ivan Ivanovich Zheleza, in Great Schema John was an Eastern Orthodox monk and saint. Saint Abraham of Rostov, Archimandrite of Rostov, in the world Abercius, was born in Chuhloma which is in Kostroma region and near the railway node Galich in tenth century. The same version was included in the Encyclopedic Dictionary of Brockhaus and Efron. Saint Sabbas of Storozhi - an Orthodox monk and saint of 14-15th century. He was the founder and first hegumen of the monastery of the Nativity of the Theotokos in Zvenigorod on Storozhi hill, which was later given the name of saint. Alipy of the Caves - Eastern Orthodox saint, monk and famous painter of icons from the cave monastery of Kiev Pechersk Lavra. Saint Alipy was a disciple of Greek icon painters from Constantinople and considered to be the first icon painter of Kievan Rus. Venerable Adrian of Poshekhonye was a Russian Orthodox monk and iconographer, who was the founder and first hegumen (abbot) of the Dormition monastery in Poshekhonye, north Yaroslavl region. He is commemorated as a saint in the Eastern Orthodox Church. Bartholomew Remov was a Russian archbishop who was martyred by the Soviet Union. The Vision to the Youth Bartholomew is a painting by the Russian artist Mikhail Nesterov, the first and best known work in his series on Sergius of Radonezh, a medieval Russian saint. It is considered "the inaugural work of the Russian Symbolist movement".